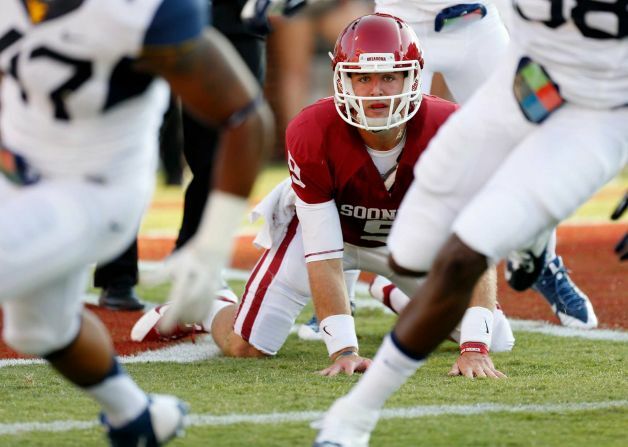 Is Oklahoma a legitimate College Football Playoff candidate? OU gets the best team on paper on its schedule, Baylor, in Norman. The second-best opponent on paper is Kansas State, and that game is also in Norman. The Big 12 overall appears to be rebuilding with numerous teams retooling rather than reloading. The out-of-conference schedule looks manageable with a marquee brand name (Tennessee) visiting Norman in September. The Sooners even have some well-timed bye weeks during the season, and no Thursday night road ambush games are scheduled. 2. The quarterback battle is over. It’s rare for an OU team to make a title run with the QB position unsettled. Last year was no exception with poor QB play in both of the OU losses. Trevor Knight is coming off the best bowl performance ever by a QB under Bob Stoops. If he brings that level of game this fall, OU's opponents are in trouble. 3. The defense is loaded. OU returns nine starters on D, including the entire front seven. Mike Stoops will have much improved depth and talent in the second year of his new hybrid scheme. 4. OU has recruited well at running back and wide receiver. The biggest offensive holes, RB and WR, are positions where OU has recruited very well. While Bob had to reshuffle his position coaches at offensive line, defensive line and tight end, running backs coach Cale Gundy and receivers coach Jay Norvell have been aces on the recruiting trail. OU graduated three RBs and three WRs, but there’s a wealth of talent on campus now and in the incoming freshman class. The battle at RB should be intense in the fall when Joe Mixon and Samaje Perine arrive. It is a position where true freshmen and redshirts routinely star in college football. The WRs on campus have all spring to seize the other two positions in the Sooners’ preferred three-wide set before Dallis Todd and Mark Andrews arrive in August. not to mention, the WR group has a clear number one in Sterling Shepard to provide leadership. 5. OU has experience on the offensive line. Again, Bob’s best teams head into battle with veteran OLs. The Sooners return six players with offensive line starts, and the new center has even started a game previously. OU brings back four full-time starters up front: Daryl Williams, Tyrus Thompson, Nila Kasitati and Adam Shead. Key reserve Dionte Savage returns, as does previous starter Tyler Evans. OU must replace All-American center Gabe Ikard in the middle. His two-year understudy, Ty Darlington, started a game as a freshman in 2012 and should be ready to go. OU has its most reliable kicker since Garrett Hartley in Michael Hunnicutt. It allows Bob to take points (see: 47-yard field goal versus Alabama in the Sugar Bowl), reliably get points (see: 'Bama missing a first-half field goal in the same game) and not chase points. 7. Bob Stoops has regained his edge. Critics have mocked "Big Game Bob" recently, but at critical times against Oklahoma St. and 'Bama, OU's head coach made the kind of aggressive gambles that worked so well early in his career. 1. OU will miss the critical play-making of Jalen Saunders. 2. Trevor Knight is still a young QB. Knight has a relatively small number of successful starts under his belt. The Sugar Bowl represents his ceiling. There’s a good possibility that future uneven games, especially on the road, are still in his future. OU just seems to have bad injury luck. Most college teams pile up injuries through the course of a physical season, but OU seems to lose irreplaceable pieces every season – Ryan Broyles, Corey Nelson, Jordan Phillips, Trey Millard, what seemed like the entire offensive line in 2009. I won’t put the whammy on any individual players by naming them as key pieces OU can't afford to lose, but you get the overall point about bad mojo. 4. The Owen Field mystique is gone. OU’s key games are in Norman, but Owen Field is no longer the unbeatable home field advantage that the Sooners enjoyed from 2001 to 2010. In the past, OU has rolled out one clunker as a favorite on the road.